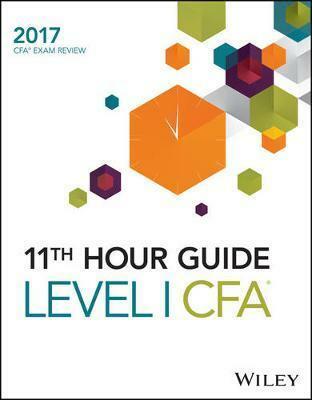 Wiley's 11th Hour Final Review Guide for 2017 Level I CFA Exam compacts all sixty readings tested on the 2017 CFA exam into one portable volume. Organized in order from Reading #1 to #60, this best-selling guide has helped thousands of candidates from over one-hundred countries pass the CFA exam. Designed to boil it all down to the crucial concepts, formulas and rules, this guide ensures candidates are familiar with the most important testable information. It's difficult to go over multiple books in the last few weeks before the exam, so Wiley's 11th Hour Review Guide does the work for you-condensing each reading down to two- to five pages. Enter the exam room with confidence and reinforce your knowledge and preparation! This comprehensive guide complements Wiley's CFA Study Guides sold separately but may be used with any review course. An effective, efficient study guide, this book prepares you to reach the next level in your career.